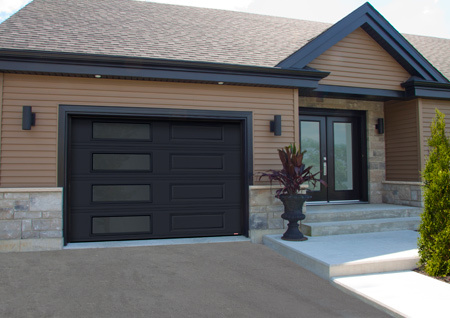 Start by taking a look at and downloading our online Installation Manual: installation manual for residential garage doors. The door is very heavy and only goes halfway up The torsion spring(s) were installed backwards. Reverse the position of the tube and spring(s). Review Step 5 in the manual. The door opens very fast but is difficult to lower. The spring(s) are wound too tight. Adjust the tension. Review Steps 5 or 5.1, depending on the spring type. The door closes quickly but is heavy to raise. The spring(s) are not wound tight enough. Adjust the tension. Review Steps 5 or 5.1, depending on the spring type. The door works well, but goes back up when it’s 2 to 3 inches from the threshold of the door. The spring(s) are a little too tight Adjust the tension. Review Steps 5 or 5.1, depending on the spring type. The door doesn’t close squarely on the floor. The floor isn’t level compared to the vertical tracks. If it is a problem with the floor, the threshold must be corrected to be level. The door is difficult to open at the beginning of its cycle. The exterior frame weatherstripping is too tight. Loosen it and move it a bit away from the door (the base of the weatherstripping should be about ½" from the door). The door is difficult to open at the end of its cycle. The horizontal tracks are not perpendicular to the axis of the door. To check, use a tape measure and Figure 17 in the manual. The top section doesn’t close completely. Adjust the position of the upper support (see Figure 16 in the manual).